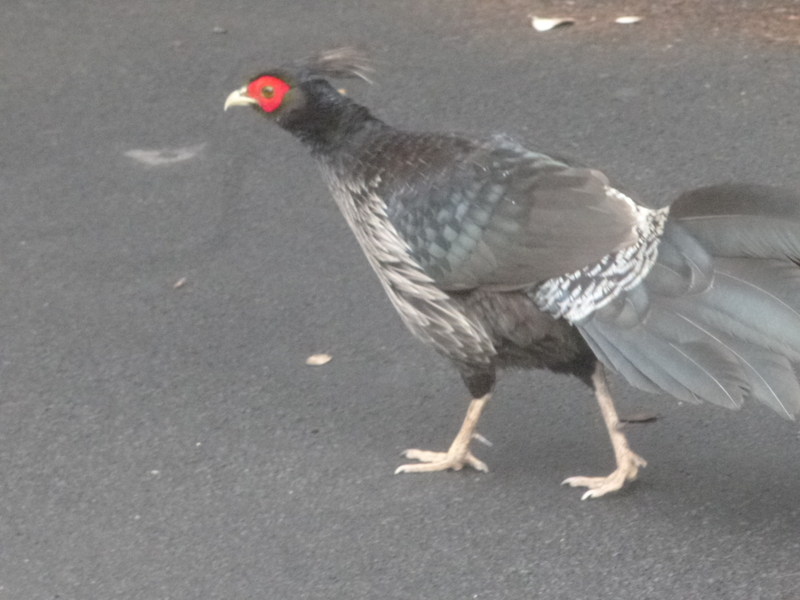 I planned to head back to the national park again today. 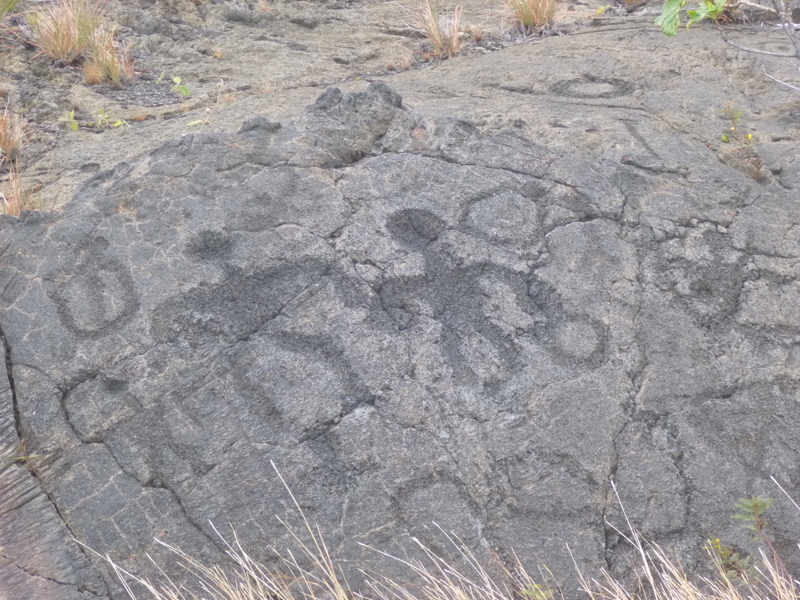 At one point, I had thought I’d try to drive up to Kona, on the west side of the island, but that’s a 5 hour round trip, and then I would miss some of the other things I wanted to see at the national park. Pele got hold of me good, and I was finding it hard to leave! But first I had to go to the 7-11 that was several miles away in the wrong direction. That’s how limited food choices were – but I knew I could get more yogurt and a banana there. 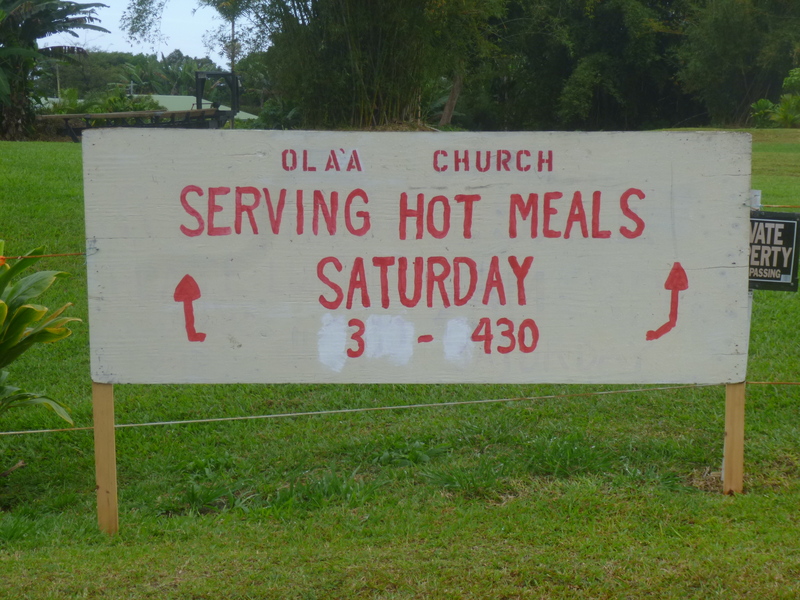 On my way, I saw a big sign by the road that said something about free meals at some church on Saturdays. I thought I would stop and check it out on my way back. As I made the turn to head toward the church, I realized it was Sunday, not Saturday! But I continued on because I thought maybe someone would be at the church to talk with about the free Saturday meals, unless the service was going on. The church was a wonderful little white building with a small porch area out front. There were 3 men standing out there talking, so it didn’t seem like a church service had started yet, so I decided to go talk with them. I was not dressed for church – I was dressed for hiking in a national park! But they started to hand me a program and welcome me to their church. I told them I had stopped by for a different reason – to help support their Saturday meal program. 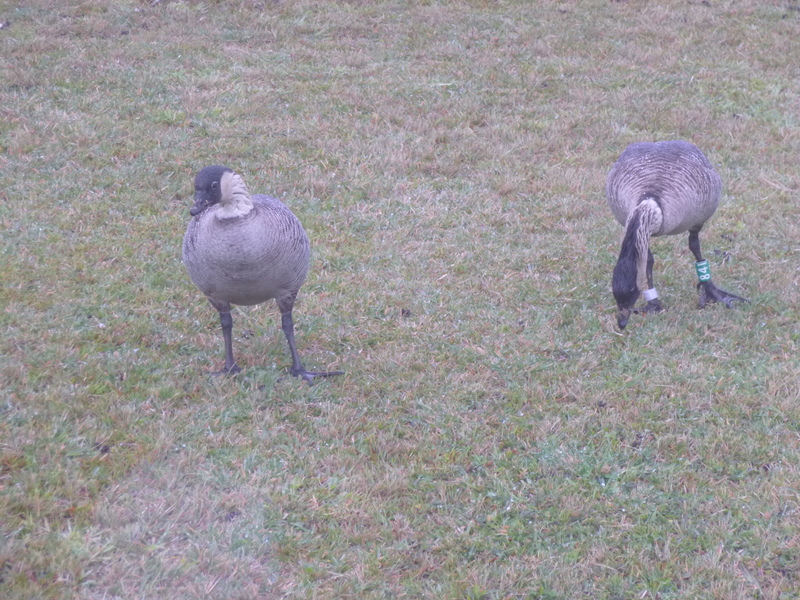 And they became very intrigued. It turns out one of the guys was the pastor. The pastor told me that by the end if the month, money becomes very tight for a lot of people, and that’s why they offer a free meal, and they would be happy to accept my donation. I could hear someone playing an ukulele inside the church, and some people were already sitting down. David, Bob and Ronald the pastor had questions about what I was doing, and where I had been, and I worried that I was holding up the start of the service. But they said there’s always some music and singing before things get underway. And the service couldn’t start without them, since it was the lay readers and pastor who were outside! We talked a bit more, and then I headed for the car to write a short note about what I was doing, and to wrote the donation check. I had told them I would just leave it on the back table. I was tempted to stay for the service, but again, there are just not enough hours in a day to do everything. By the time I finished writing the note and the check, I was surprised to still see the guys standing outside. The pastor asked if I would please come inside to share my story with the congregation. Gulp! 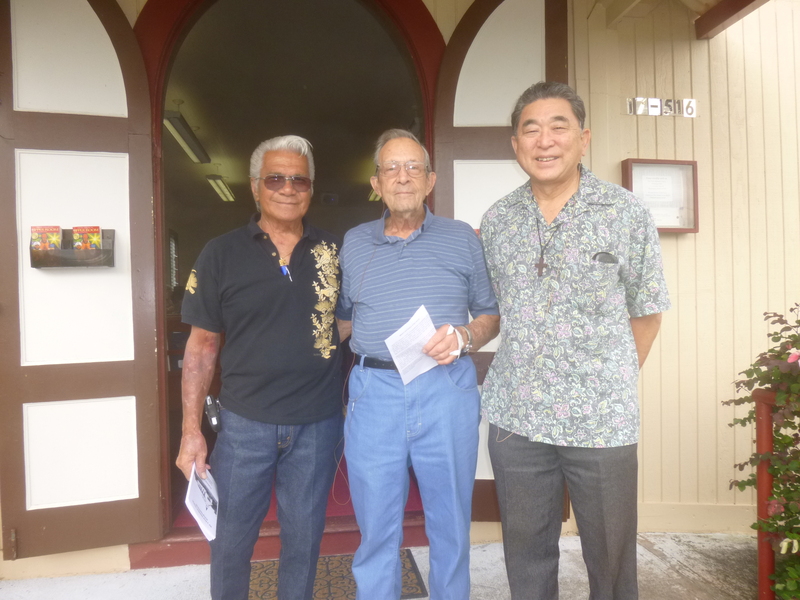 He led me in, and I was happy to see it wasn’t a huge group of people – mostly older Hawaiian people, and I saw later that a good deal of the service was in Hawaiian. Other than being in my usual jeans and a tshirt, it actually wasn’t that difficult to talk to them about my journey. I kept it short, and they all clapped when I was done. They had a couple questions, and were thankful for the donation, and some people even got out of the pews to hug me on the way out. And one of the lay readers gave me a shell lei, which I wore all day. It ended up being an absolutely wonderful, unexpected stop. 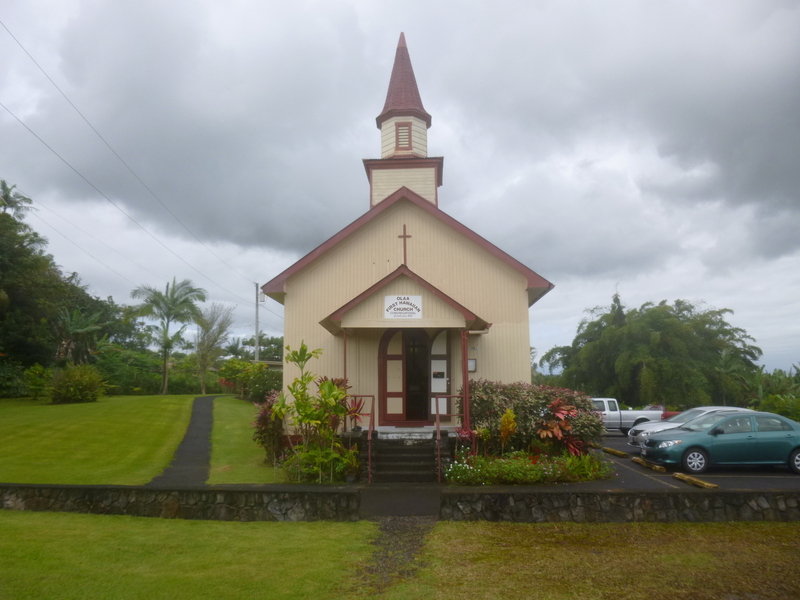 I had headed out for yogurt and ended up talking to a small congregation at an old Hawaiian church. Talk about a special start to the day! 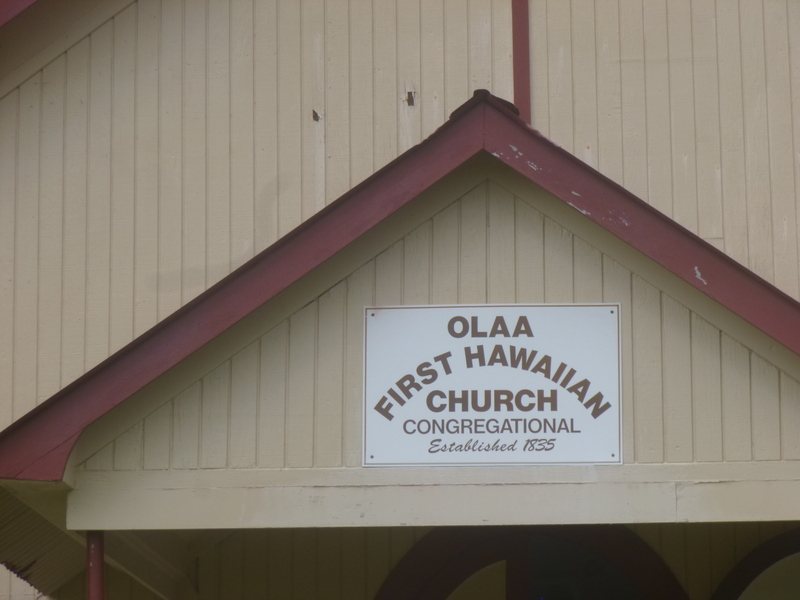 The church was established back in 1835 in the sacred Ola’a forest, way before Hawaii was a state. And a lot of the church program is written in Hawaiian, along with the Lord’s Prayer. I soaked all of that in while I was driving back to the national park, and then things began to get a soaking outside as it started to rain hard. When I got to the park, I just found a dry spot to wait until the rain let up. Since I was a little later getting there than planned and it was raining, I changed my mind about what walks to do. 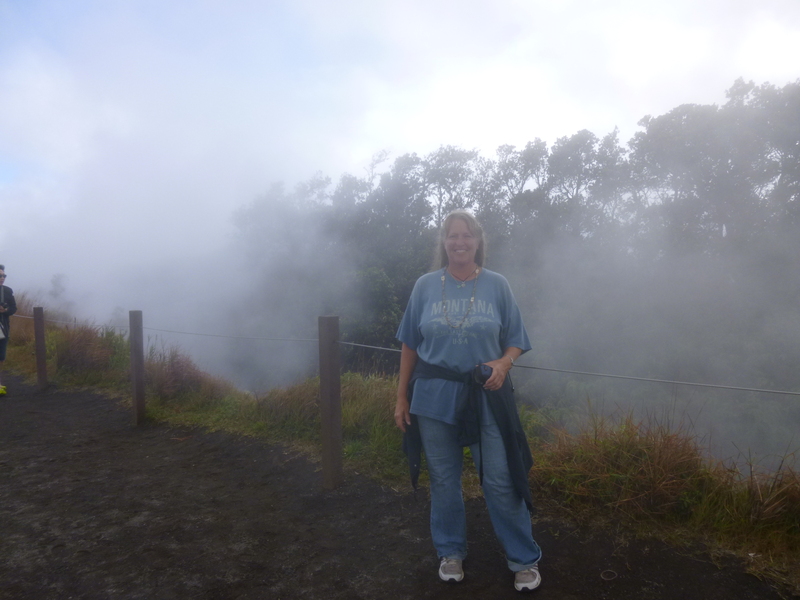 I was going to do another crater walk similar to what I did yesterday, but didn’t want to be on the steep parts of the trails when they were wet and slippery. 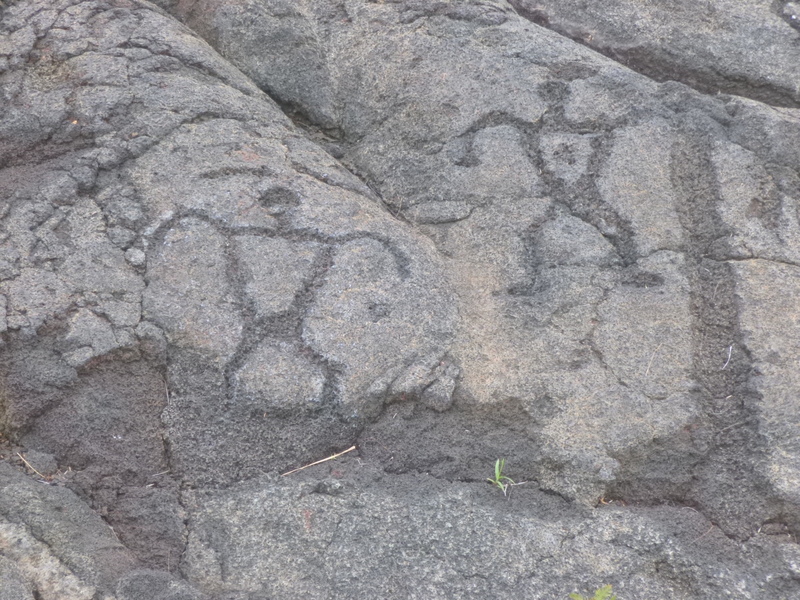 Once the rain let up a bit, I headed out to walk the part of the Crater Rim trail that was still open. 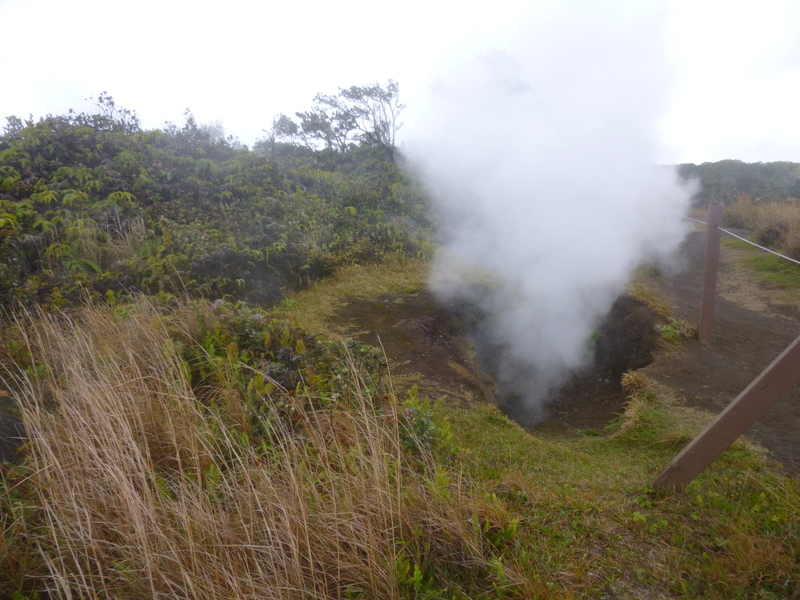 It led past an area with a lot of steam vents, and in the drizzle, the warm steam felt good. It gave the whole area a foggy, misty feeling. 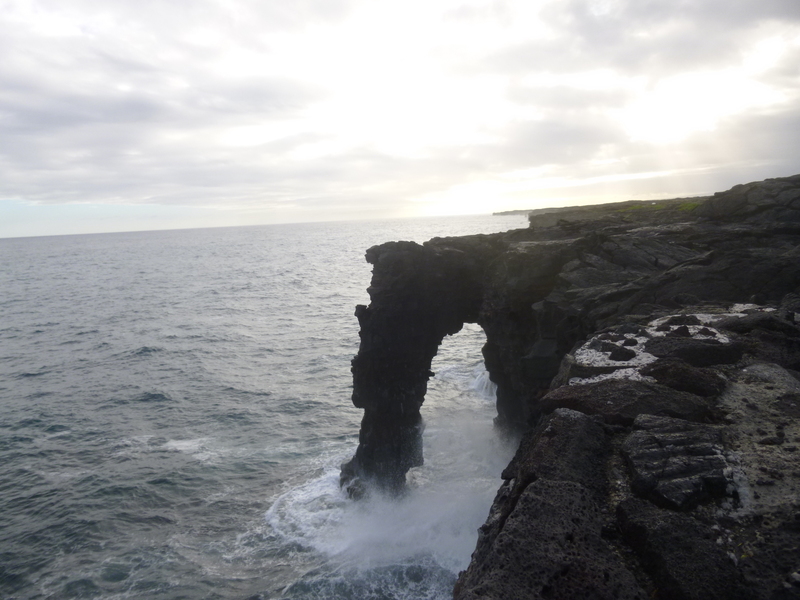 Then I wanted to drive down the Chain of Craters road all the way down to the sea. It’s about 35 miles each way, descending all 4000 feet on the way down. 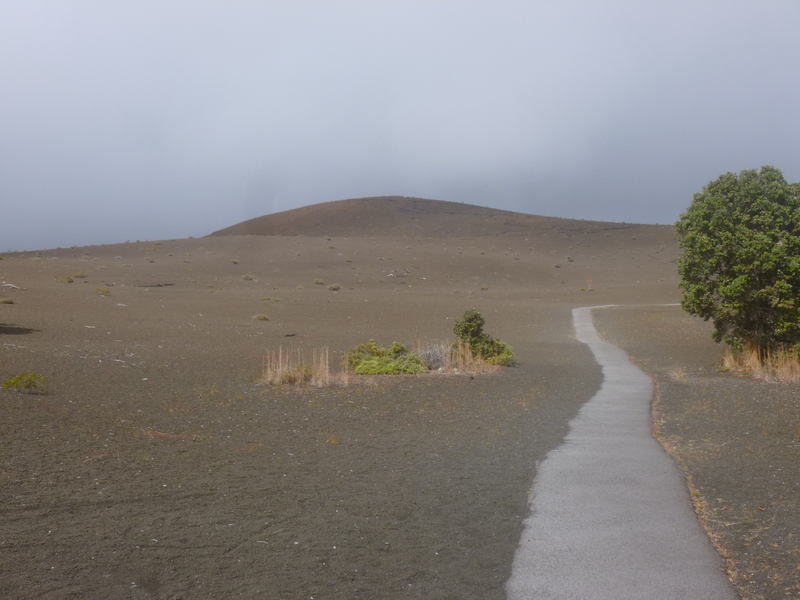 There were numerous stops and walks along the way – Devastation Trail which went through a moonscape area where nothing seemed to be living, and lots and lots of lava fields from several eruptions – some going back to the 70s. 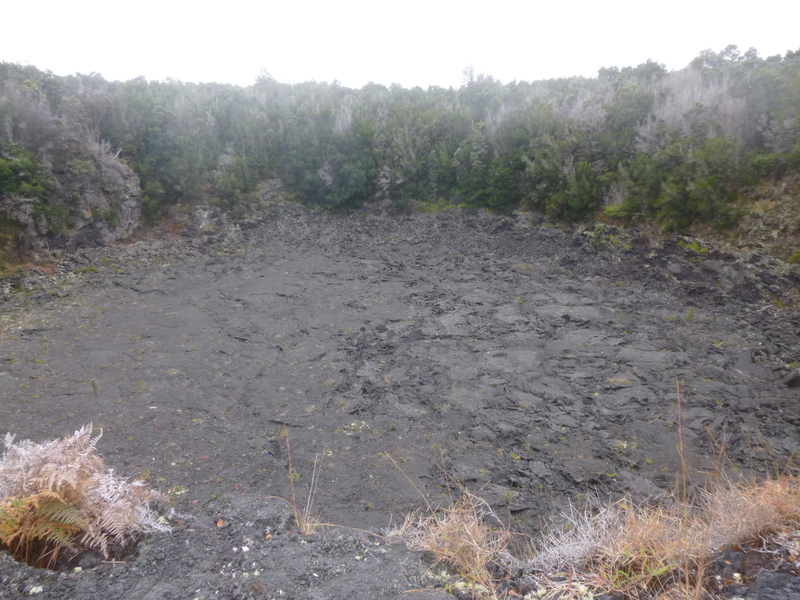 There were several old craters to see too – it took a long time to drive the 35 miles with all the stops! Near the bottom there was a 3/4 mile trail that led to an area of old petroglyphs, and a boardwalk to walk on to view them without damaging them once we got out there. 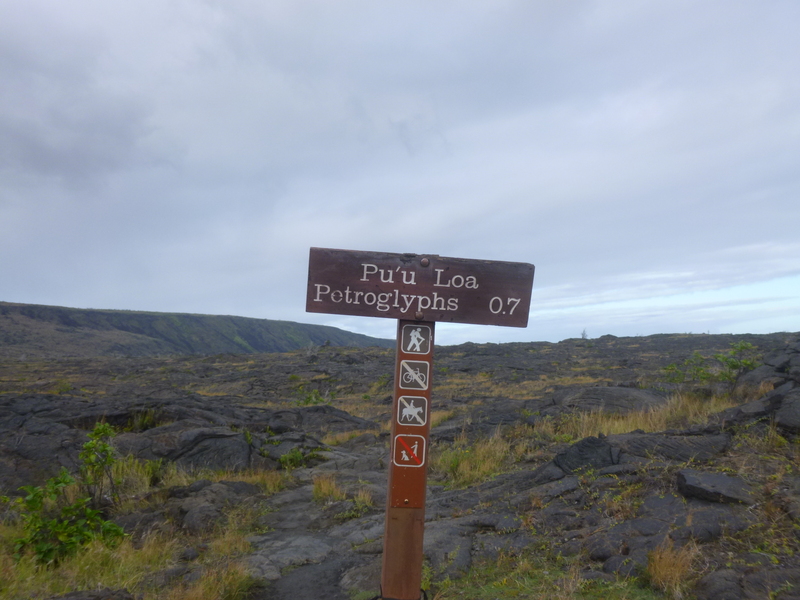 The walk was not an easy one – very rough ground, and the trail was marked by stone piles, and it wasn’t always clear. The few people who were out walking made better markers! Then down by the ocean there was an area to watch the waves crashing into cliffs, and then the road was closed off, and a good half mile down I could see yet another lava field. 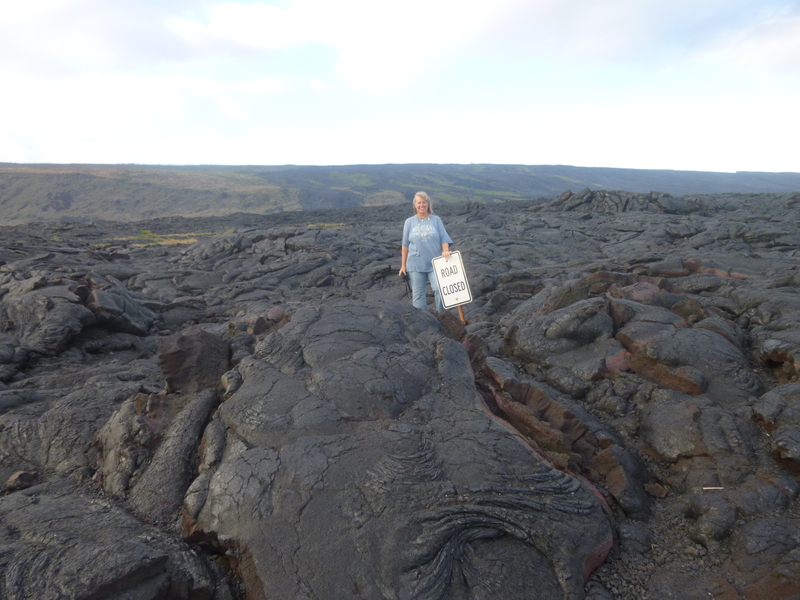 It was a beautiful evening out so I walked down to that lava field too. 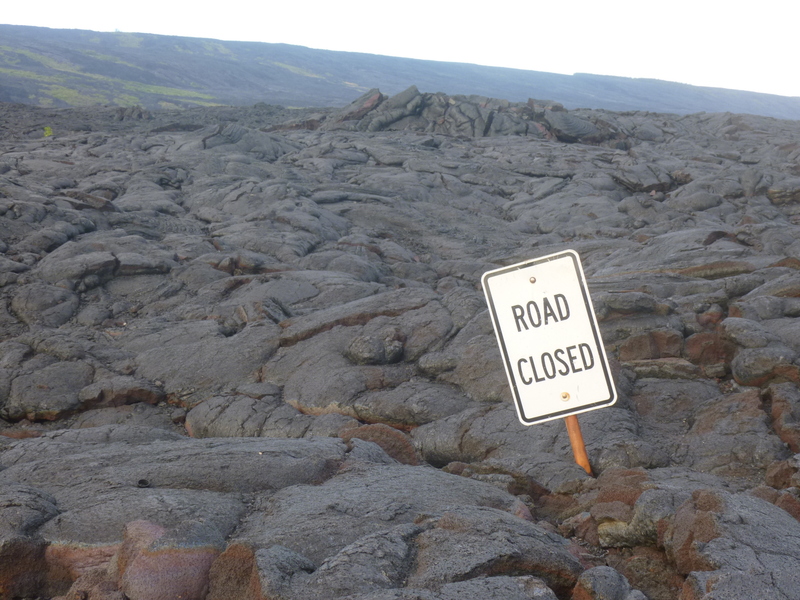 It’s so strange to see a normal road, and all of a sudden it’s blocked by lava. People were climbing all over the lava, which stretched out about as far as I could see. I walked out on it a ways, and actually came to a ‘No Parking’ sign sticking out of the lava – I think it’s a pretty popular sign for photos! I walked back to the car, and enjoyed the 35 mile drive back up to the top. Earlier in the day, I saw one of the gift shops had a nice selection of salads, but I just missed – they closed about 10 minutes before I got back. So I headed back to the general store for a sandwich again. 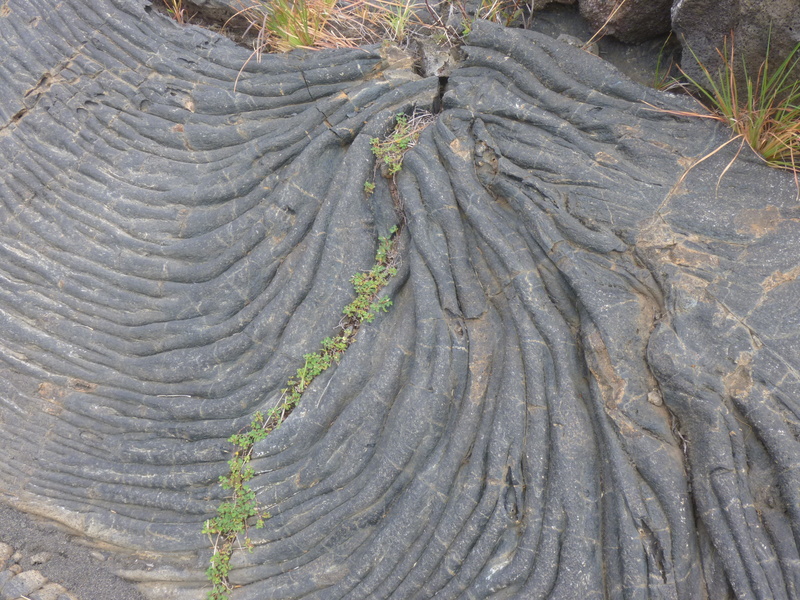 Since I had seen so many lava fields today, I wasn’t going to drive back down to where I was last night – it was too dark anyway. I just wanted to end my Hawaii stay with some time looking at the orange glow from the volcano. The full moon added to the colors of the night – it wasn’t right over the volcano, but close enough to be in the same field of vision, so on the eve of my flight to the farthest away part of my journey, I’m once again treated to a full moon and a fiery glow – just like when I began my journey nearly 5 months ago! I was at Ola’a Church on the Sunday you visited. 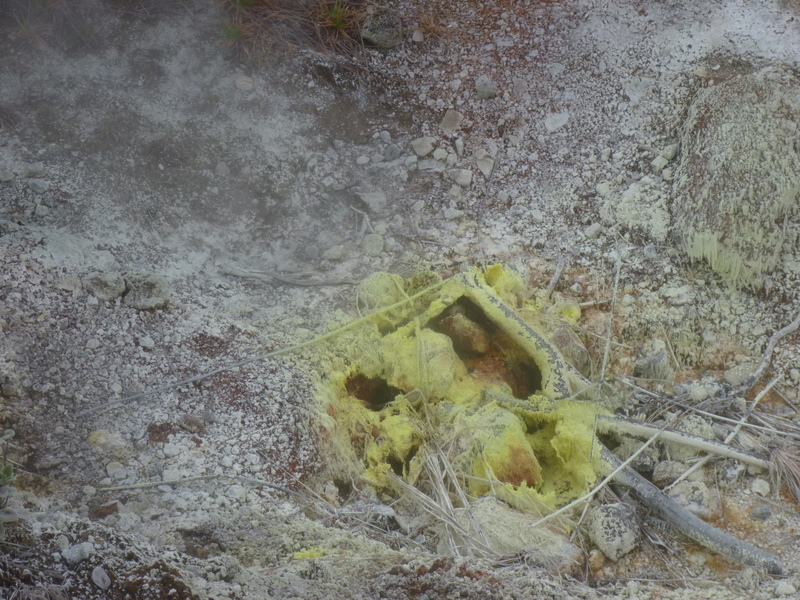 We really appreciated that you were willing to take a detour on your visit to the volcano and stop by and visit. Mahalo nui (thank you very much) for blessing us with your words and the gift for our monthly free meal.